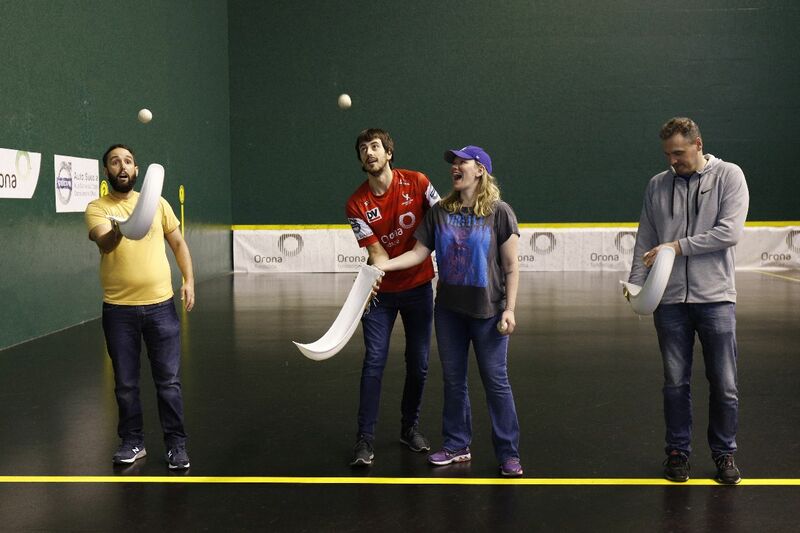 JAI ALAI ACTIVE EXPERIENCE At Hernani's Galarreta Jai-Alai Languages: Spanish and Basque. English and French on request. Dates: Thursday and Saturday, at 15.00 pm in the front door of the Galarreta Fronton. How to arrive:Two bus lines run directly from downtown San Sebastián to the fronton. Guided tour: 1-	From 15h to 15:10 Short introduction to the remonte game and Galarreta history. 2-	From 15:10 to 15:40 Entering into the court to see how the balls and the basket are, touch and try them, explanation of the rules of the game and see how a professional player hits the ball to feel the real speed of a ball on movement. 3 From 15:45 to 16:15 Explanation and demonstration of the artisanal way of manufacturing baskets and balls. Differences on how they were done in the past and how they are now (structure, materials…) 4	From 16:20 to 16:30 Explanation of the beating system with the bookmakers (corredores de apuestas) and little bet (2 € per person) for the second match (blue or red). 5	From 16:30 to 16:40 Visit the "box" where tv transmissions are made to have a different perspective of the game. After the guided visit you can see the matches. REMONTE Remonte is one of the most spectacular forms of Basque pelota played with a cesta, a basket used to catch and throw the ball. The sport requires great technique and speed of its players, who must hit the ball with the cesta and hurl it out the basket's opening. This is done in one fluid movement: the ball must remain in constant motion. This makes Remonte unique among the other forms of pelota played with cestas. Remonte dates back to 1904, when Juanito Moya, a pelota player who was rather small in build, came up with this particular form of the sport. Moya spent years competing against larger opponents in a form of pelota played with leather gloves. 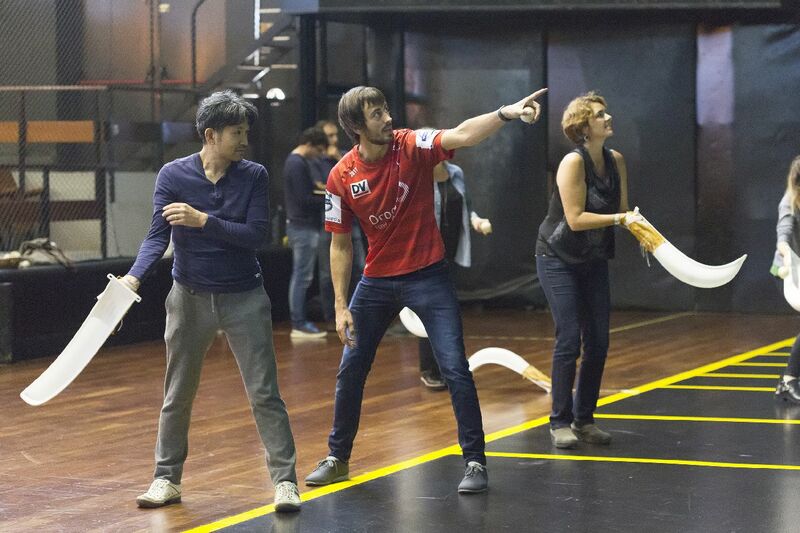 But this new form of pelota allowed him to hurl the ball farther and faster than anyone else. Remonte soon gained popularity among Navarran and Gipuzkoan pelota players. REMONTE PLAYERS Today, more than 30 professional Remonte players practice this spectacular form of Basque pelota on the Euskal Jai Berri Fronton in Huarte and the Galarreta Fronton in Hernani. The history of Remonte, which goes back more than 100 years, has seen some extraordinary pelota players that have stood out among their peers. Of these, Jesús Abrego and Koteto Ezkurra are the most remarkable. The latter continues to delight us all with his great skill, showing that he is still the best in the sport. THE GALARRETA FRONTON Renovated in 2010, the Galarreta Fronton has a large capacity, seating 1200. Its car park has 350 parking spaces. Price (Tax included): Adults 30.00€, Young People From 18th to 29th years old 15.00€ Feel yourself as a "remonte player" for a day! We invite you to come down to the court with one of our players and feel the speed of the ball and the sensation of fitting a basket in your hand. We will explain you the rules of the game and how we make the balls and the baskets in an artisan way.